On Aug. 20, the “Silent Sam” Confederate statue was removed during a protest at the University of North Carolina in Chapel Hill. 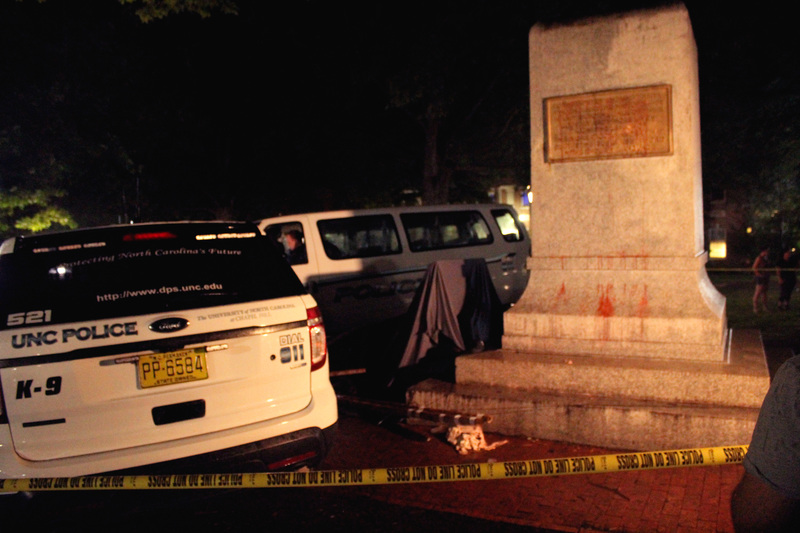 Nearly two months after it was toppled, the university’s Faculty Council has requested the permanent removal of the monument, according to the Daily Tar Heel, the campus newspaper. Prior to this request, debate over the fate of the confederate statue had amounted to several demonstrations following its removal at the beginning of the semester. “It was originally Maya Little’s court date…and we were gonna rally that afternoon,” Grace Barger, a sophomore at Salem College, said, recounting the night of the Aug. 20 protest. Barger, attended the rally and witnessed the toppling of the confederate monument. She explained that though Little’s court date was moved to Oct. 15, the demonstration continued as planned. “We were all really worried about the cops, but they didn’t do anything,” Barger shared. Police did act in the protests that followed the toppling of Silent Sam, however. From a protest on Aug. 25 through rallies in early September, police arrested demonstrators. According to the Daily Tar Heel, 26 people have been arrested since Aug. 20, and 11 people have appeared in court, including Maya Little. In an interview with the Daily Tar Heel, Lindsay Ayling, a Ph.D. candidate at UNC, said the toppling of the statue should not be illegal because “it brought UNC into compliance with federal law” that prohibits racially hostile learning environments. To Ayling, the unlawful actions of the students were warranted given the lack of action from the university over the statue. Though the university agreed with demands to remove the statue, “a state law made it impossible to remove the statue” without governmental permission, according to the New York Times. Grace Barger had only recently become involved in activism. Still, she feels strongly about the presence of Confederate statues on college campuses. While the Faculty Council of UNC Chapel Hill has a month to decide upon whether the confederate statue will be permanently removed or relocated, the 2015 Heritage Protection Act also has implications for a Confederate monument in Winston-Salem. “Our Confederate Dead” is the only monument to the confederacy present in the city, according to an article by the Winston Salem Journal. It is located in downtown Winston-Salem on 4th Street. Conversations about the presence of the statue, like the debate around Silent Sam, have increased due to the deadly violence of the Charlottesville, VA rally in 2017. But monuments of the confederacy have been a heavily protested issue for years. “People have been protesting Silent Sam since the 1960s,” Barger said. Like Silent Sam, “Our Confederate Dead” was erected through the efforts of the United Daughters of Confederacy. According to the Winston Salem Journal, this organization greatly opposes the removal of such monuments, despite criticism of their continued existence. “Their [the statues] continued presence is a reflection of the inequalities that are still deeply seated in our nation’s institution,” Kadia King, a senior at Salem College said. Among proposed compromises, a request to move the statue to Salem Cemetery on 513 Cemetery St. was made in 2017. No action or response to this proposal was given, and, according to an article by the Winston Salem Journal, the UDC “will delay any decision” until another ruling is made on the removal of three confederate statues in Raleigh. Even with the possibility of relocating the statue, students at Salem are dissatisfied. “Regardless of where it is, unless it’s in a history museum…a cemetery is better, but still not ideal,” Barger said. King, a Political Science major and president of Salem College’s organization of Black Americans Demonstrating Unity, agrees. She especially takes issue with the publicness of the downtown monument. Whether either monument in Chapel Hill or Winston Salem will be permanently removed is still uncertain. Like King, though, similar sentiments exist at UNC Chapel Hill.